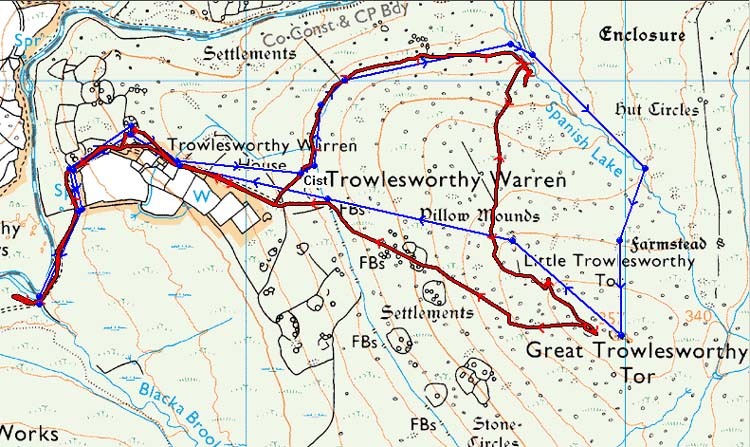 This walk: 2008-5-29 - Trowlesworthy Farm, cist, leat, Spanish Lake, Great Trowlesworthy Tor, Little Trowlesworthy Tor, possible reave. 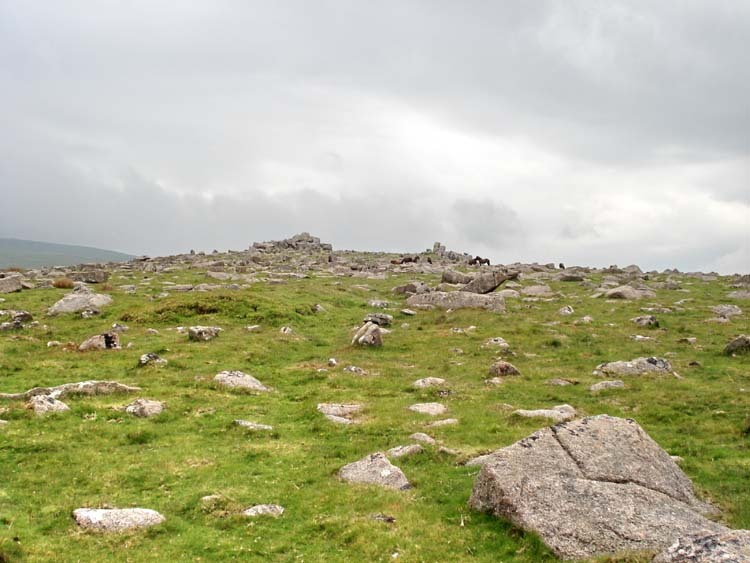 This walk was based on Walk 7 - "To the time when rabbits were on the moor" in the Dartmoor Rescue Group book "Walking in Southern Dartmoor". View across the River Plym, at the very start of the walk. 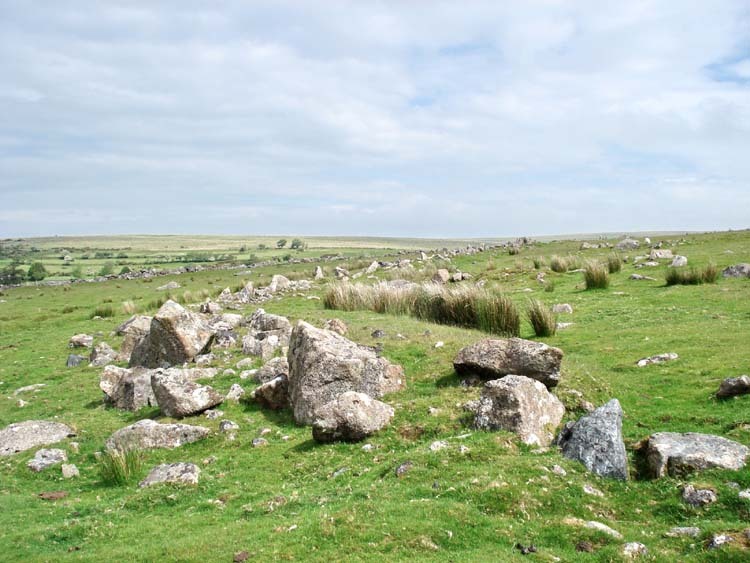 The northern edge of the settlement at SX 56682 64890. 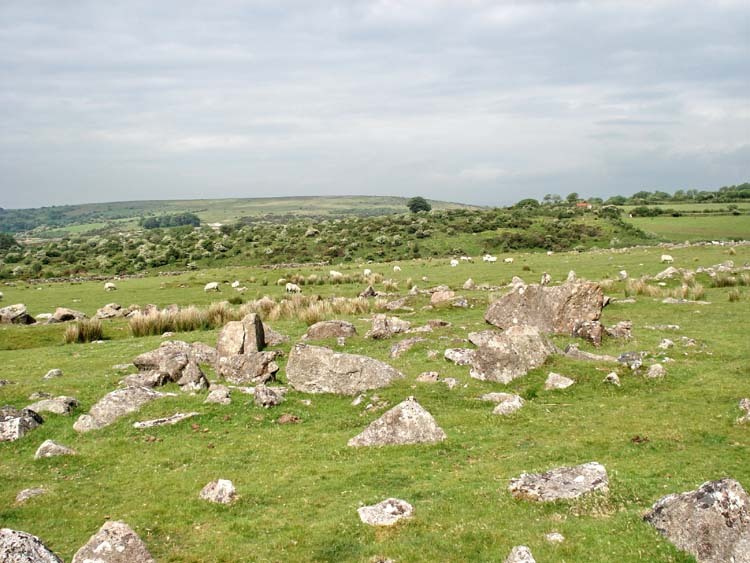 View of a hut circle in the settlement. Two door posts are prominent to the left, facing south-west. 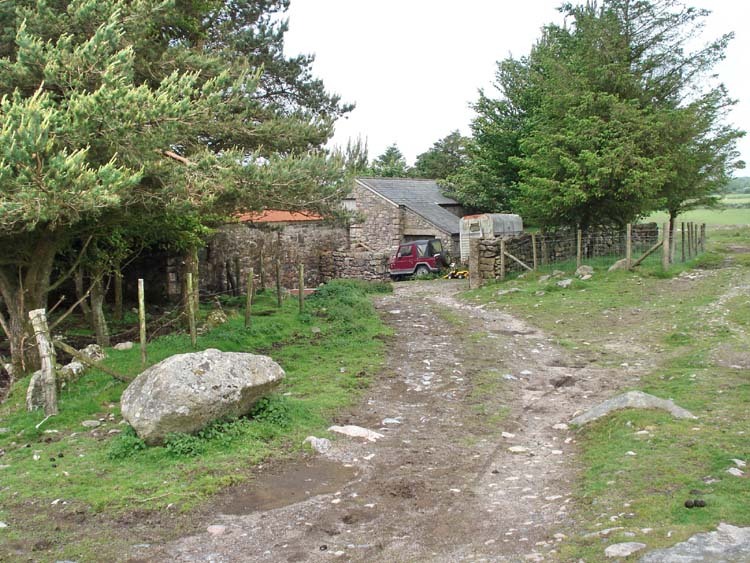 Rear entrance to Trowlesworthy Farm. 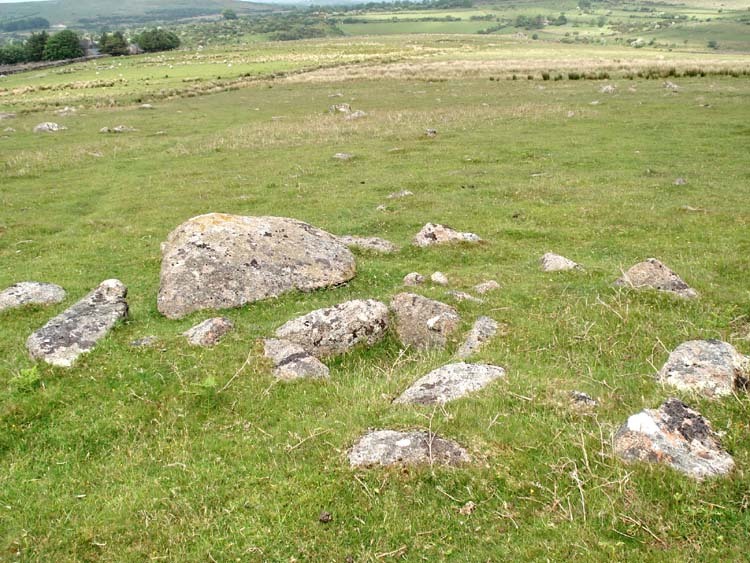 Cist at SX 57140 64753 ± 5 meters (GPS 'fix'). 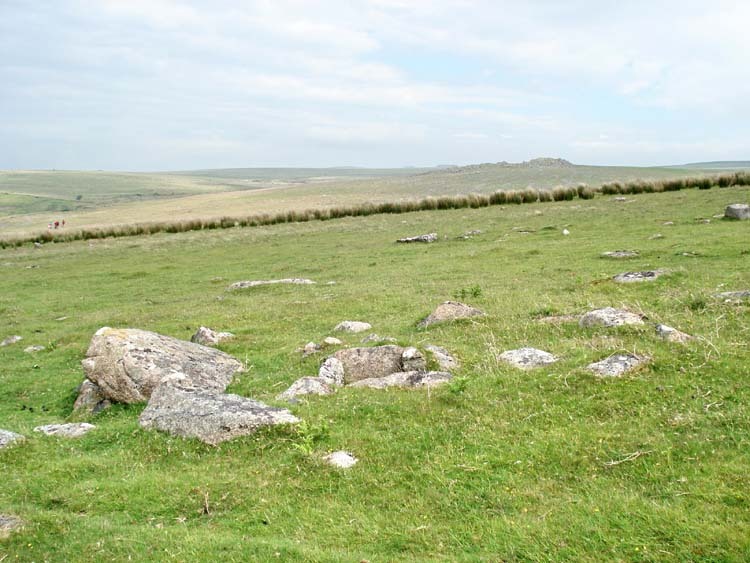 The cist with Legis Warren and Legis Tor (SX 571 655 ) in the background. 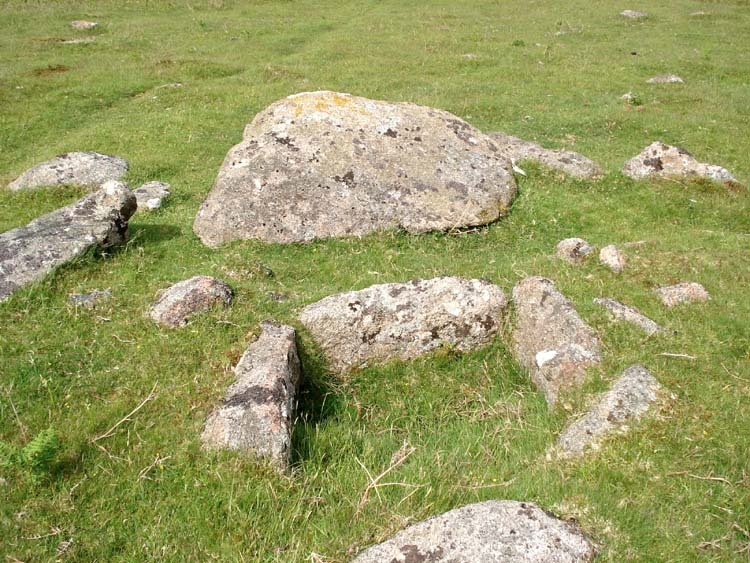 Close-up view of the cist. 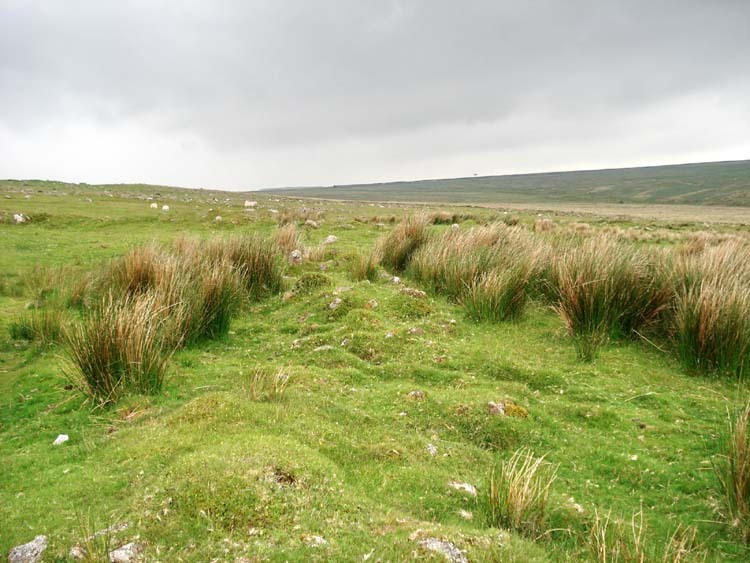 Rushing leat at approx. SX 572 649. 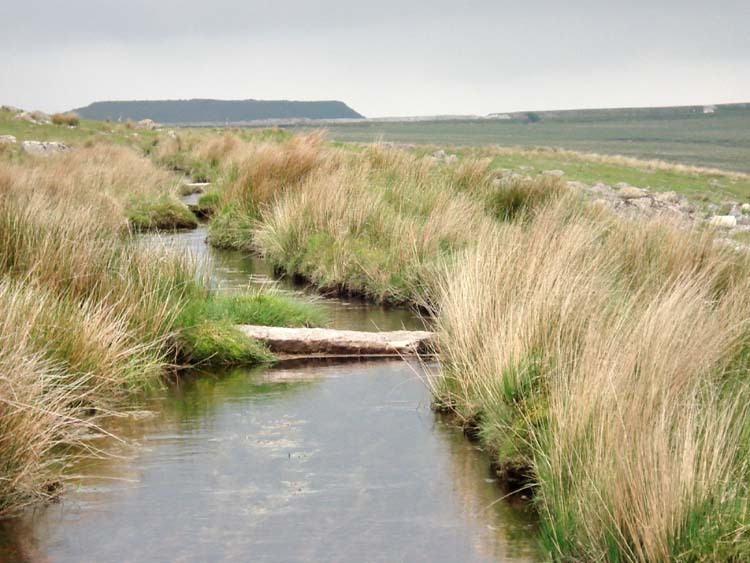 Spanish Lake, on the left, with the leat coming in from the left (middle distance, and crossing the stream. 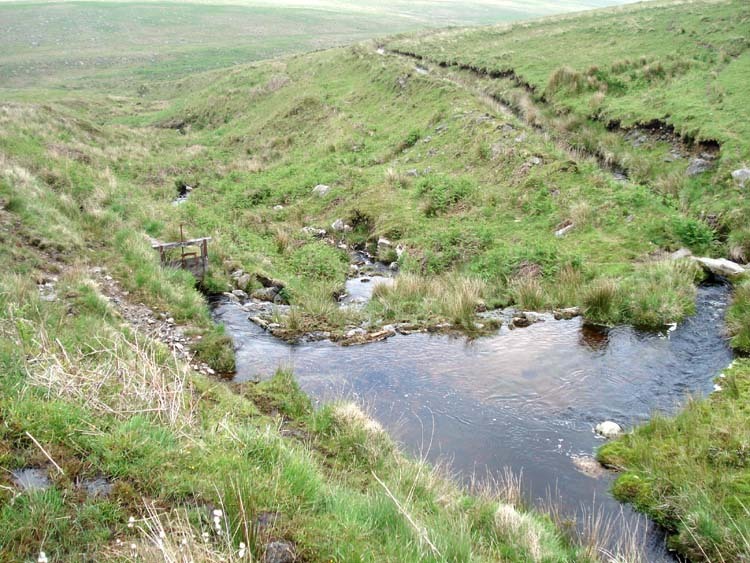 A sluice to govern flow into the leat can be seen towards the right of the photo, in the middle distance. 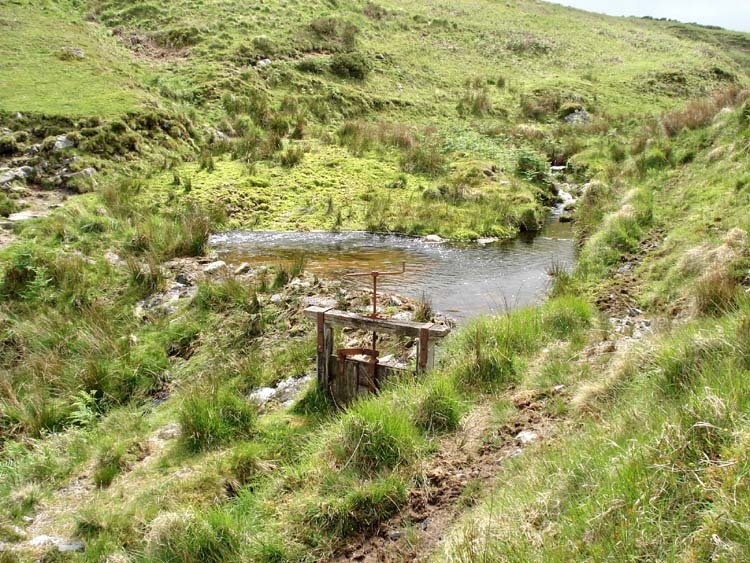 A view of the sluice mentioned in the previous photo. The narrow clapper bridge appeared to be under water after the recent heavy rain. 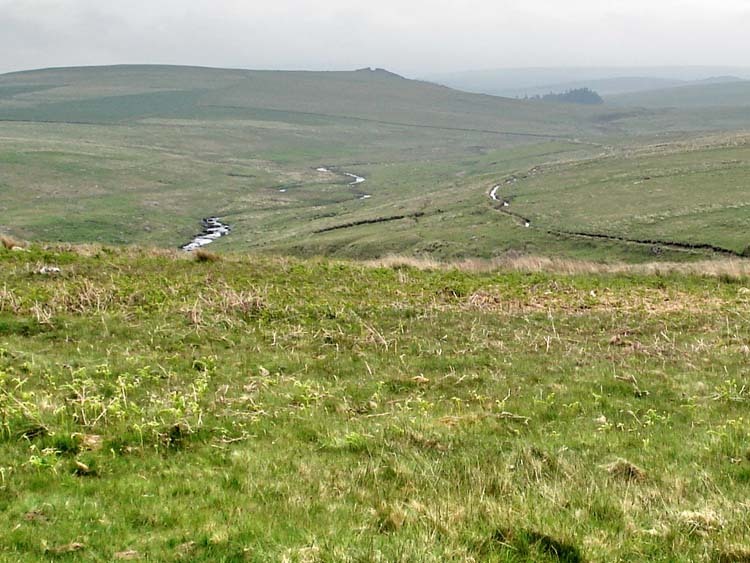 Another view of the leat/Spanish Lake area, looking up the Plym Valley, the leat can be seen running towards the right. 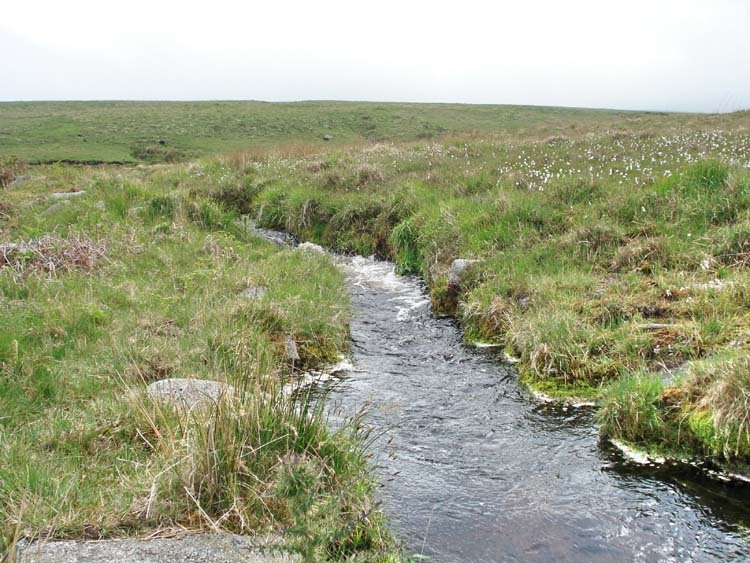 A view up the Plym Valley with the leat towards the right of the photo. 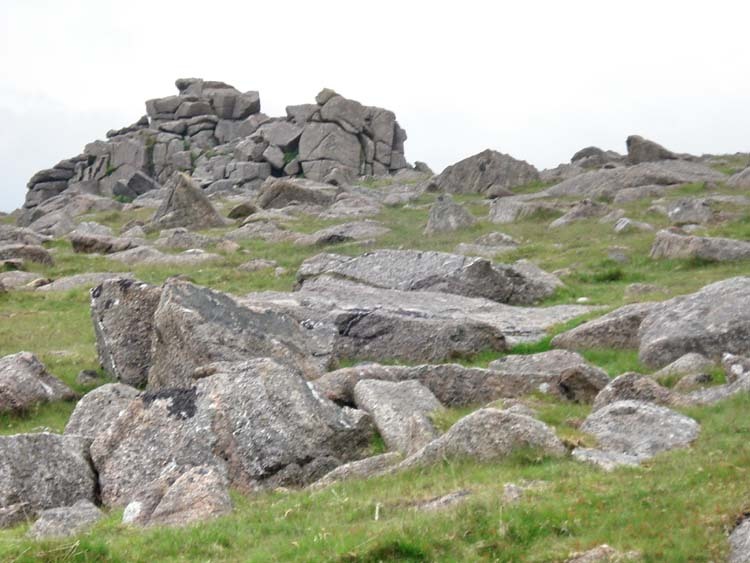 Gutter Tor is prominent on the skyline and the trees around the Scout Hut are also visible. 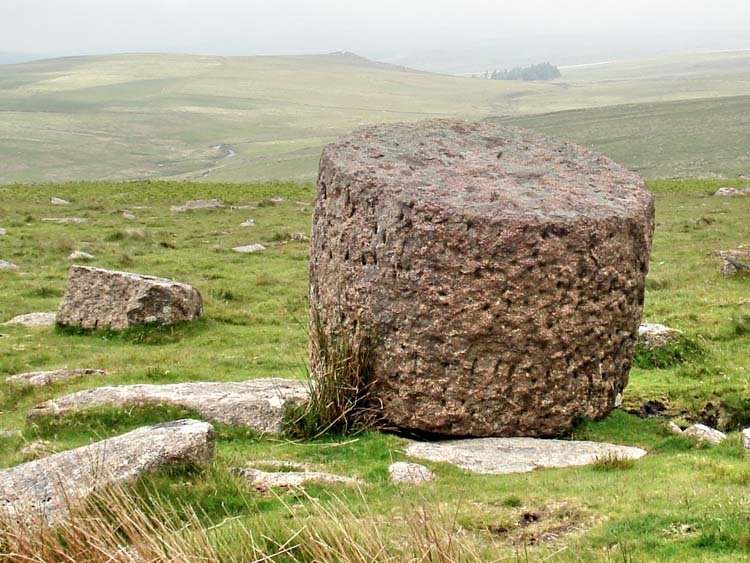 The reddish-tinged unfinished flag pole base dating from the early 1800's near Little Trowlesworthy Tor. 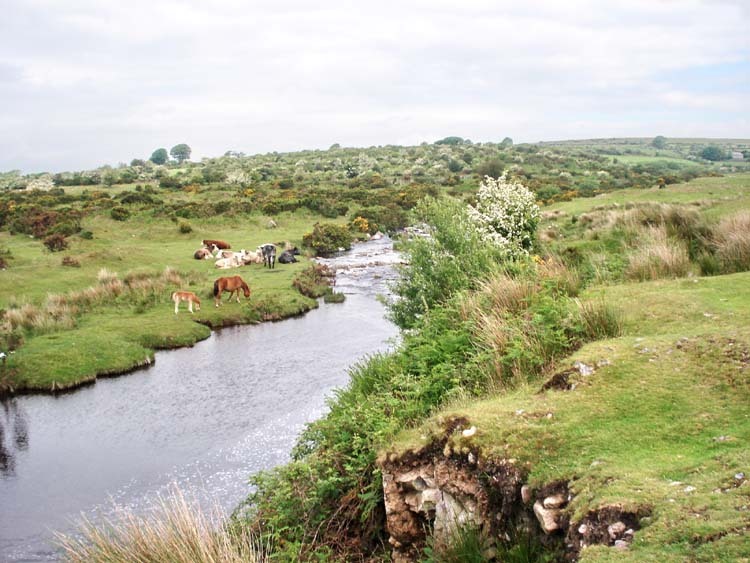 The River Plym, Gutter Tor and the Scout Hut trees are all seen in the distance. 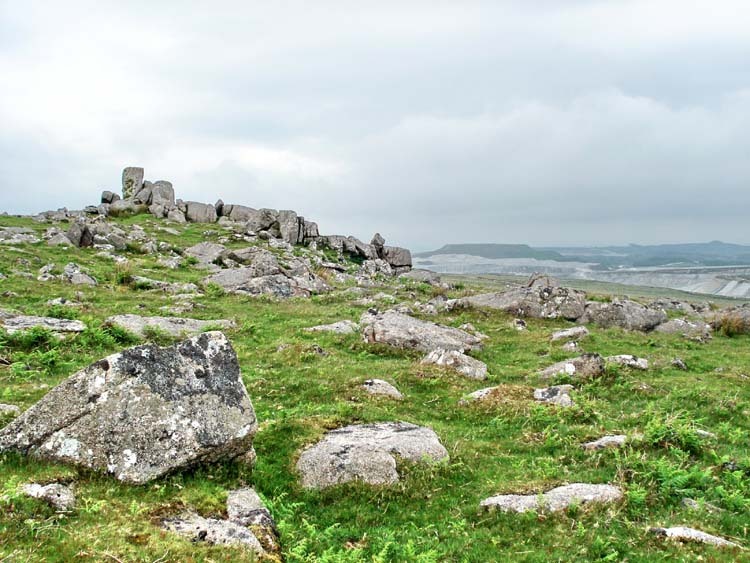 Part of Great Trowlesworthy Tor with a 'greened up' china clay waste tip in the distance, with a flattened top. 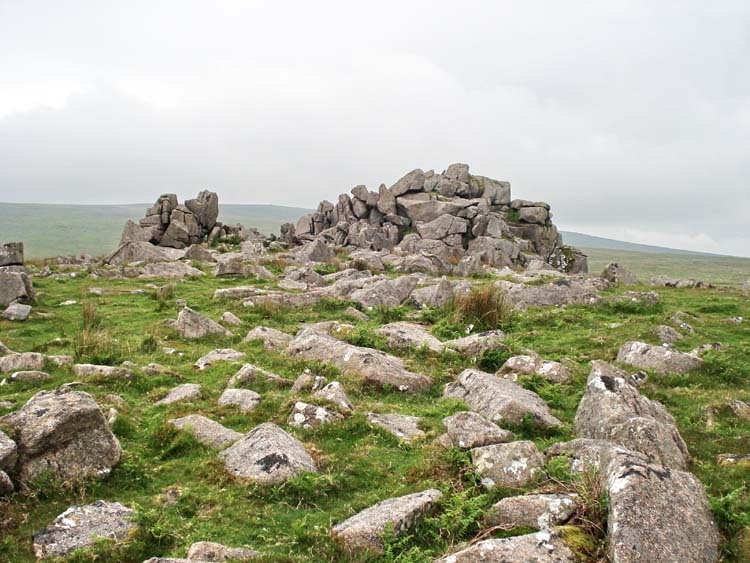 Part of Great Trowlesworthy Tor. 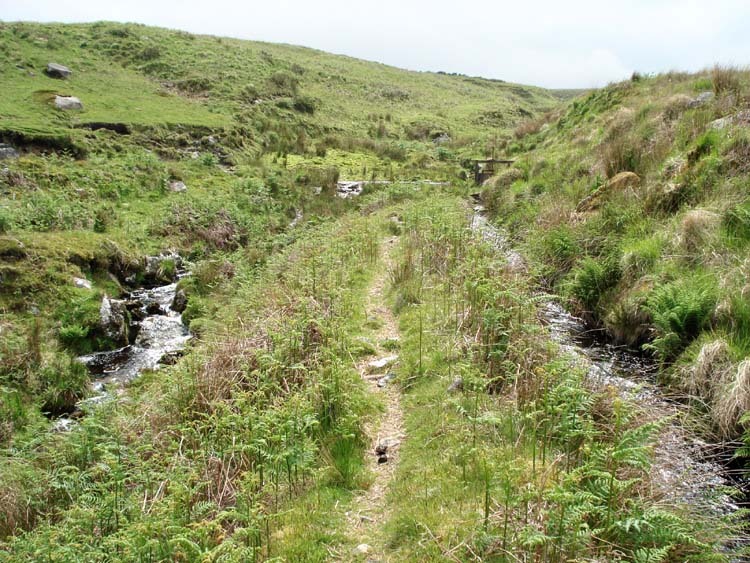 Looking along the leat towards the cleaned up waste tip at the china clay works, with two foot bridges in view. A possible reave at SX 57100 64665, or other old boundary/field wall shown on the map as a black line, probably a newtake wall around Trowlesworthy Warren House. The walk was approached via Plympton, taking the road to Cadover Bridge; after passing the large car park and turning right before reaching the bridge. Then, drive 700 meters/770 yards to the first track on the left. A good car park can be seen from the junction, before a concrete bridge, beyond which is a National Trust sign and a notice saying vehicle access only to the farm.